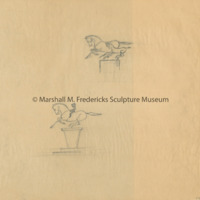 Sketches of horses and horseback rider. 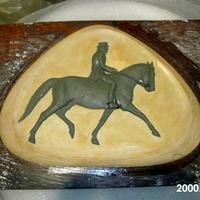 Clay relief on plaster and wood of man riding on a horse in costume. On back of the wood board is a sketch for the Danish crest. Triangular in shape. 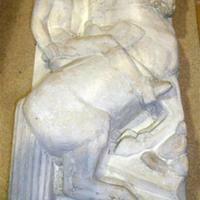 Plaster relief of man riding on a horse in costume. 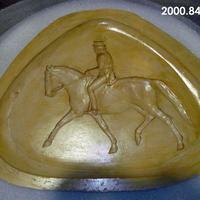 Written on back is "Mike Sutton Dressage Plaque". Mold is triangular in shape. 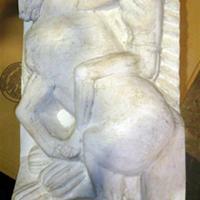 Plaster relief of man riding on a horse in costume. Triangular in shape. 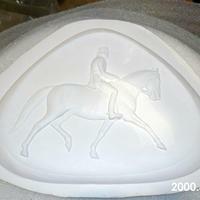 Plaster mold of man riding on a horse in costume. 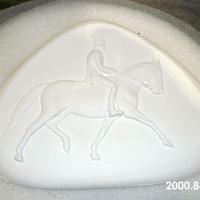 Written on back is "Mike Sutton Dressage Plaque". Yellowish color from shellac applied to seal the plaster. Mold is triangular in shape. 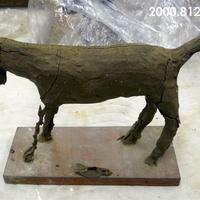 Horse or dog figure that is made of clay. 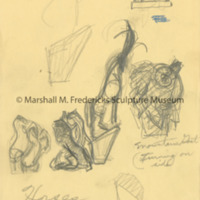 There is a wire armature in the middle and a wood base. Part of the proper left front leg is missing or unfinished. There are a lot of cracks in the clay. 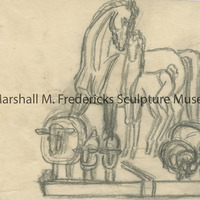 Sketch for "The Family (Farm Animals)"
Plaster deep relief of a mad riding a horse. The horse is standing on its back legs. The horses tail looks like a fluted Greek column.